With a population of just 40 men and 49 women, Maigini — Karnataka’s last village — sits just 5km away from Goa. Nestled in a forest, a narrow but tarred road connects Maigini with Karwar, the district headquarters. Every election, voters of this little Konkan village travel at least 3km to cast their votes. The Election Commission of India sets up four polling stations in the gram panchayat that includes villages of Hankon, Hotegali, Hankonjog, Gopashitta and Maigini. All of the close-knit 30 households in the village belong to the Konkani-speaking Kunabi community and share the ‘Gaonkar’ surname. There is a road, there are electricity poles and TVs in a few houses but water remains the biggest problem for the people of Maigini. Heavily dependent on rainwater for agriculture, much like the rest of Uttara Kannada, people of Maigini have been seeking a solution for their water problems for decades now. 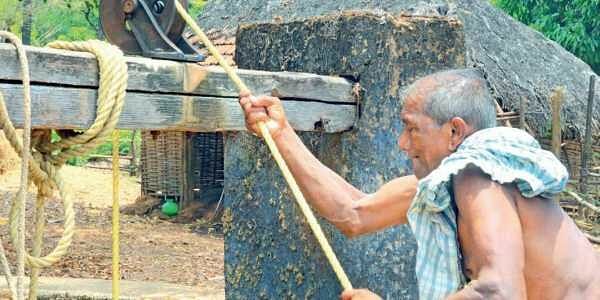 Govind Goankar (70) needs the support of a cane to walk but has no option but to draw water from one of the only two wells in the vicinity every single day to tend to his cattle. The only man who speaks Kannada in the village, Gaonkar explained how the young men here are forced to travel to Goa in search of work. “My son, along with the other boys from the village, works in Goa. There is nothing for them in this village,” he said. 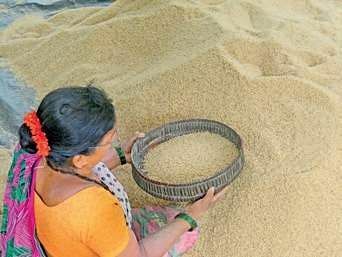 Every year, the residents of Maigini, all of whom own small land holdings, grow one crop of paddy that lasts three months. Rest of the year, the youngsters go to other cities and towns in search of work. While no MLA or MLA aspirant visits the village, party workers come seeking votes but the people of Maigini know who their elected representative is. “Our MLA is Satish Sail,” says 48-year-old Radha Krishna Gaonkar. She pointed towards red chillies she had put out in the sun when this reporter asked her what she does on a daily basis. Her family owns a small piece of land on which they grow beans, chillies and paddy, a variety of parboiled rice. The last village of Karnataka on the Karwar-Goa border, Maigini takes pride in voting. “My son takes me and my wife on the bike to vote,” Govind Gaonkar smiles. Govind is the only APL card holder in the village but also the owner of the only house that doesn’t have a toilet. “Those who have BPL cards were given money to build toilets but since I own 2 acres of land, I hold an APL card hence no money for me,” he says. The eleven schools under the gram panchayat teach only in Kannada but the Konkani-speaking children of Maigini are reluctant to converse in it. Irrespective of the distance, the entire village makes it a point to not waste their vote. While local police are still in the process of setting up a temporary check post, people of Maigini are already all set to vote.